HAPPY NEW YEAR BLOG WORLD. Also Happy Birthday to our lovely Anita over at TTPH. I hope that you are enjoying your surprise blog hop so far and you carry on and enjoy all the way to the end. Enjoy your birthday. Here is my card that I created for you using my new watercolour pencils to colour in my gorjuss girl stamp. I loved colouring with my watercolours and can't wait to practice some more. Here is the full blog hop list in case you got lost. Great job with the watercolor pencils! Love this card! Very, very pretty. 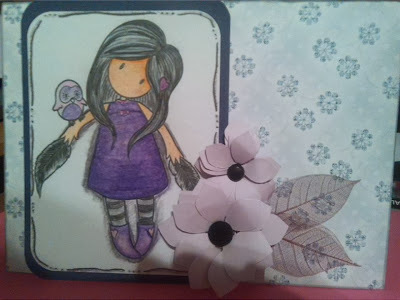 Love the watercolor effect..
Beautiful card! I love it! Great coloring!